Realizing that properly celebrating Halloween is probably a lost cause at this point, I went south of the border to get a head start on celebrating Dia de Los Muertos which takes place from October 31st to November 2nd. 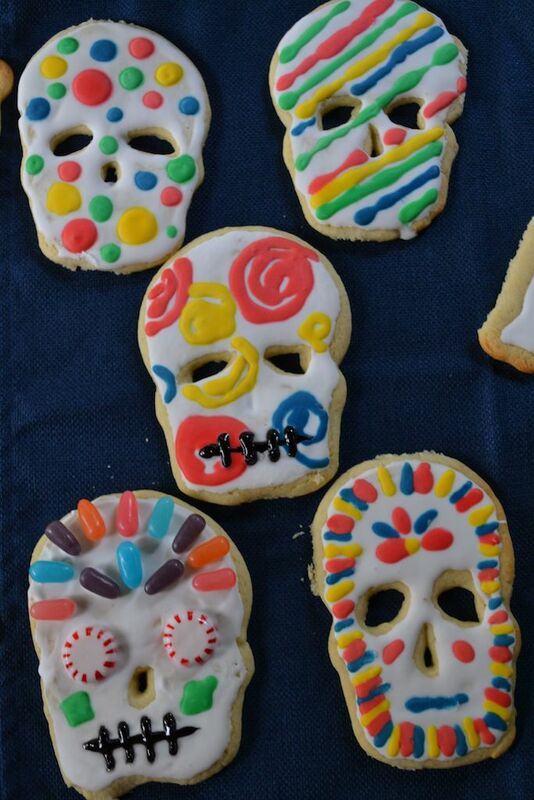 Dia de los Muertos, or Day of the Dead, is a Mexican holiday to celebrate and remember the dead. It’s far from morbid however. There are parades, families prepare special foods for their dead loved ones, and the decorations consist of colorful skeletal folk art rather than the vampires and ghouls of our Halloween. 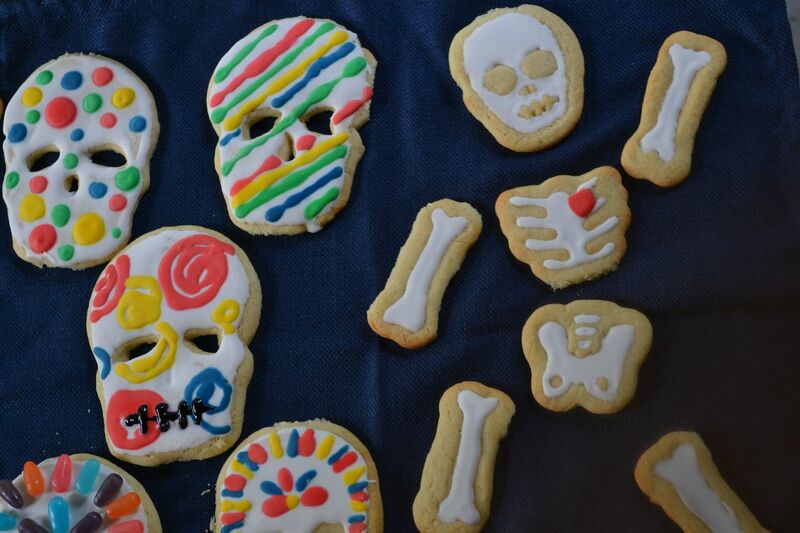 While my recipe for cookies is not a traditional Mexican recipe (the sugar cookie recipe below is passed down from my Grandmother), I do try to mimic the spirit of Dia de los Muertos with brightly-colored icings and candies. There’s no creepy spiders coming out of eyeballs or blood dripping out of mouths, but the end result is far more edible in my mind. 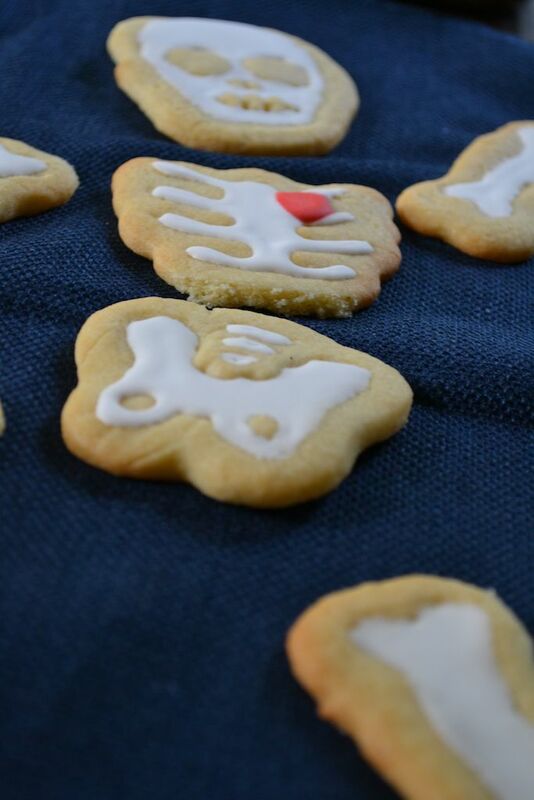 The recipe for royal icing below makes enough icing for one batch of cookies. I divide the icing into small quantities and mix up the desired colors using food coloring. I then pour the icing into small squirt bottles for easy decorating. Stored with a bit of plastic wrap over the tip of the bottle, the icing will keep for several days. There are times when procrastination is advantageous and today is one of those times. Halloween decorations, including cookie cutters, are on sale right now and for those of you whom the holiday snuck up on you’ll be pleasantly surprised to find that the picked over costumes and candy baskets at least have a price tag that makes you feel like you scored. 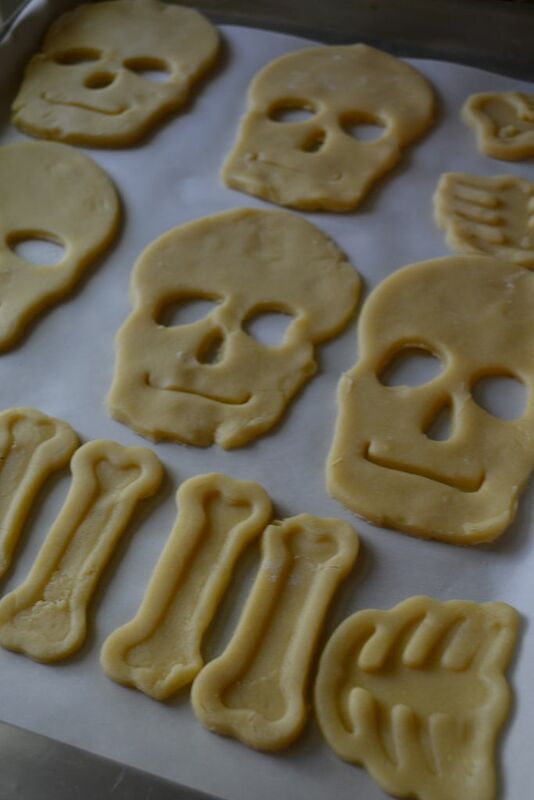 I found these deeply discounted skeleton cookie cutters at Williams-Sonoma. * Regarding the note on being a miser with candy: My husband, if he is reads this, will applaud this miserly behavior. He believes he knows what is best for the child and will pick out no more than one piece of candy and carefully drop it in the child’s bag. On the opposite end of the spectrum, I’m a bit stunned by so many small people in costumes on my doorstep. They tend to gang rush you when the door opens and the already ridiculous amount of candy they have eaten leaves their eyes crazed and manic. It’s terrifying and I may close my eyes when I hold out the basket of candy (after all, this is my preferred mode of self defense). Even with eyes closed however, I can’t escape the sound of candy hitting the ground as they pull out bulging fistfuls. When I answer the door, our candy is pillaged. On a positive note, Halloween typically ends early at our house as we run out of supplies quickly. Double the recipe! 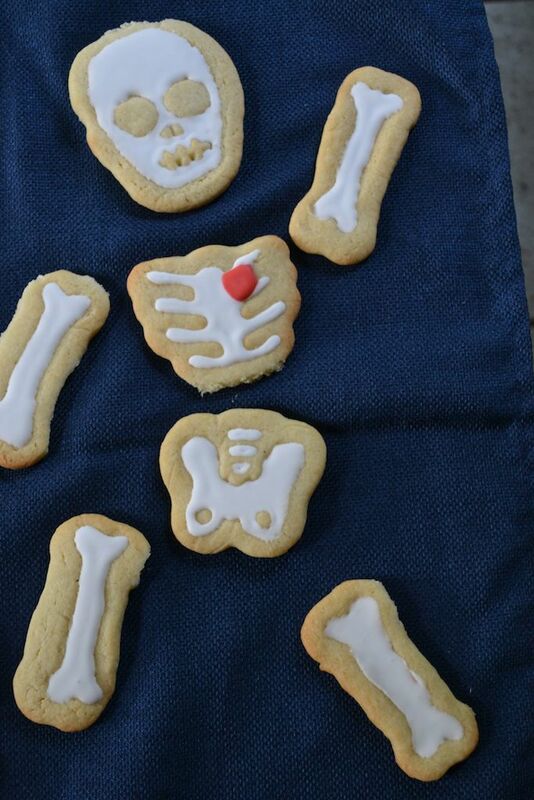 These cookies (without icing) freeze well and they don’t last long. You’ll be glad to have extras on hand. Bake the cookies for 8-10 minutes. Cookies should still be soft. Remove from the oven and cool for five minutes on the baking sheet before transferring to a wire cooling rack. 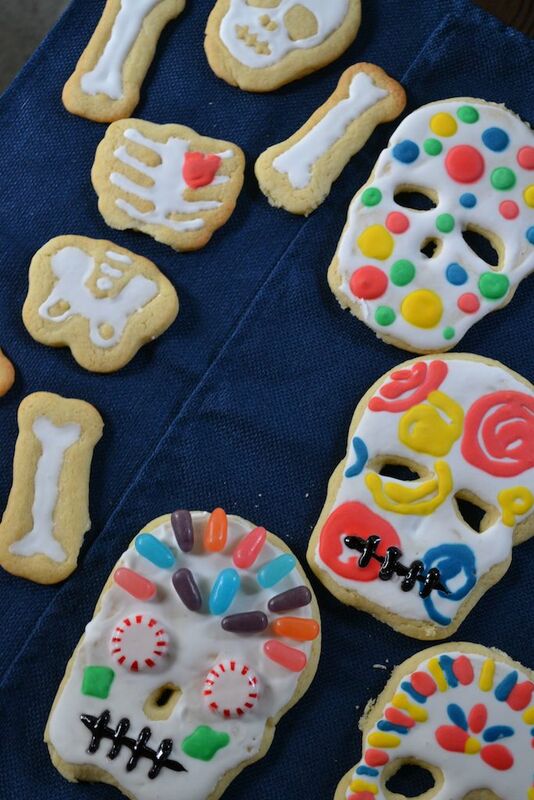 For decorating sugar cookies and gingerbread cookies. In an electric mixer, beat the confectioners’ sugar, dried egg whites, vanilla, and warm water on low speed until combined. Increase the speed of the mixer to medium and beat until the frosting is thick and has a glossy sheen, about 4 minutes. If the icing is too thick, add a little more warm water. If too thin, add some more confectioners’ sugar. Color the icing with food coloring as desired. To pipe icing, spoon icing into a squeeze bottle or pastry bag. This all sounds and looks delicious! Thanks! If you give them a try, let me know how they turn out!